Jabibi Bos * 07/06/2014 is a fantastic PRE gelding, unblemished, playful, healthy and naturally grown up. He shares his paddock and food with a welsh cob pony so he has grown up in freedom and has enough time to play and run around. Jabibi has been started under the saddle in July 2017 and is very good, cooperates well and has a good attitude to work. 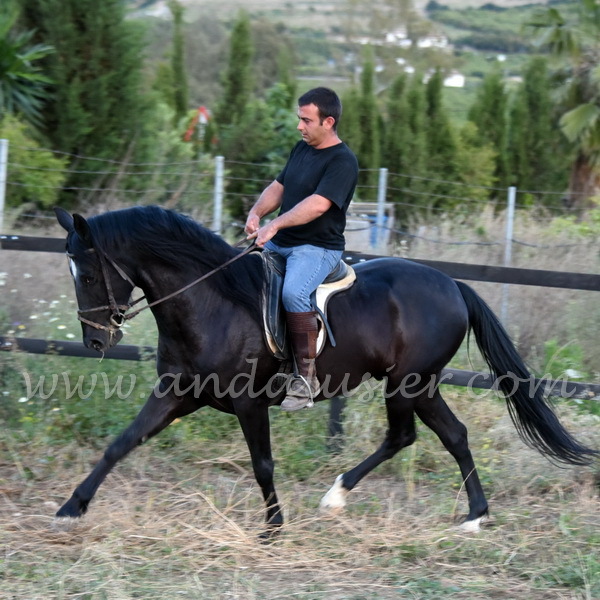 He has walk, trot and canter without putting any pressure on him, very slowly and with a lot of heart and sensitivity. His pedigree is very impressive showing all the old ancestors from the yeguada military such as: Maluso, Agente, Leviton, Jenson but also Bohorquez, Pedro Lopez Dianez. He is bred by the breeder El Torno de la Cartuja.